Our Community Outreach and Engagement Core (COEC) partnered with stakeholder advisory board member Rebecca Bratspies of CUNY Law School’s Center for Urban Environmental Reform (CUER) to produce a short animated film based on Mayah’s Lot, an environmental justice themed graphic novel. The story follows a young hero/protagonist, Mayah, who takes action to prevent the dumping of toxic waste in her neighborhood. 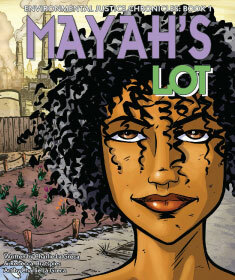 To watch Mayah’s Lot click here. This entry was posted in Feature of the Month on December 29, 2016 by mountsinaitceee.